When buying a car in Maine, you must obtain certain required paperwork from the seller in order to register and title your vehicle. If you buy your car from a dealer, they will normally process the required paperwork on your behalf. However, if you buy the car from a private seller, you will need to visit the Michigan Secretary of State (SOS) to register and title the car in your name. Continue reading this article to get more information about the paperwork required when buying a car in Michigan. The certificate of title, filled out and signed by the seller. An odometer disclosure statement (this may be included on the title or Form BDVR-108). Lien release documents (financed vehicles). Vehicle inspection certificate (salvage vehicle). Don’t purchase a car without a title. If the title is missing, ask the seller to obtain a duplicate title for you. However, you can still buy a car without a title if the car is paid off or the computer system at the Michigan Secretary of State holds a record of the title. Bill of sale is not required when registering or titling your car. 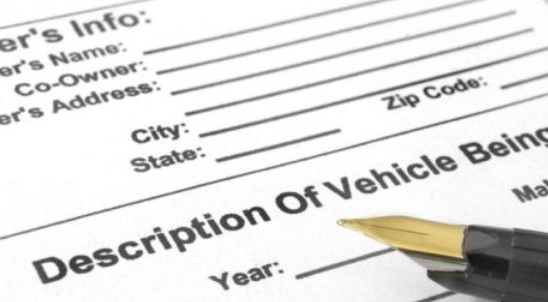 However, this document is required in your record to provide proof of vehicle purchase and ownership if any question arises challenging the legality of the vehicle. Proof of Identification (Michigan driver’s license). Payment for fees and taxes: Sales tax, which is normally 6% of the purchase price. Registration fee. $15 title transfer fee. You can transfer your old license plates and car registration to your newly purchased car with the Michigan SOS. You will need the above listed documents, your current registration and license plate number of the car you are transferring. You also need to pay $8 title transfer fee. By obtaining this report, you will be able to make informed decision about the car you are purchasing. This report will also help you avoid misleading sellers and purchasing a lemon.